Below is a useful contribution to my meditation music thread. It comes from the much-missed Pauline Oliveros writing in her book Deep Listening: A Composer's Sound Practice. It is of particular interest because not only does it legitimize the link between serious listening and meditation, but it also extends that practice to sounds beyond those conventionally considered 'musical'. This opens meditative listening to genres that received wisdom places outside the 'classical' canon such as the ambient electro/acoustic compositions of Robert Rich and Steve Roach which featured in earlier posts. (I will return to the thorny question of what is classical music? in the near future). Deep listening is a form of meditation. Attention is directed to the interplay of sounds and silences or the sound/silence continuum. Sound is not limited to musical or speaking sounds, but is inclusive of all perceptible vibrations (sonic formations). The relationship of all perceptible sounds is important. The practice is intended to expand consciousness to the whole space/time continuum of sound/silences. Deep Listening is a process that extends the listener to this continuum as well as to focus instantaneously on a single sound (engagement to targeted detail) or sequences of sound/silence. In order to acquire the discipline and control that meditation develops, relaxation as well as concentration is essential. The practice of Deep Listening is intended to facilitate creativity in art and life through this form of meditation. Creativity means the formation of new patterns, exceeding the limitations and boundaries of old patterns, or using old patterns in new ways. In other traditions such as Sufism meditative trance empowered by music expands consciousness. As has been recounted here, it has been my privilege to experience the power of meditative trance in the dhikr of the Naqshbandi Sufi Order and an all-night Gnawa lila. Pauline Oliveros' Deep Listening practice shares with the teachings of the mystic G.I. Gurdjieff, whose teachings were influenced by Sufism, the ambition of expanding consciousness. So the piano works created by Gurdjieff and Thomas de Hartmann, which include tableaux depicting Rituals of a Sufi Order, should be included in my recommended music for meditation. Notable 'Gurdjieff's greatest hits' albums have been made for ECM by Keith Jarrett and by Frederic Chiu for Centaur. The pioneering exploration of the complete Gurdjieff/de Hartmann œuvre by the recently departed Alain Kremski is deleted and fetching a premium. 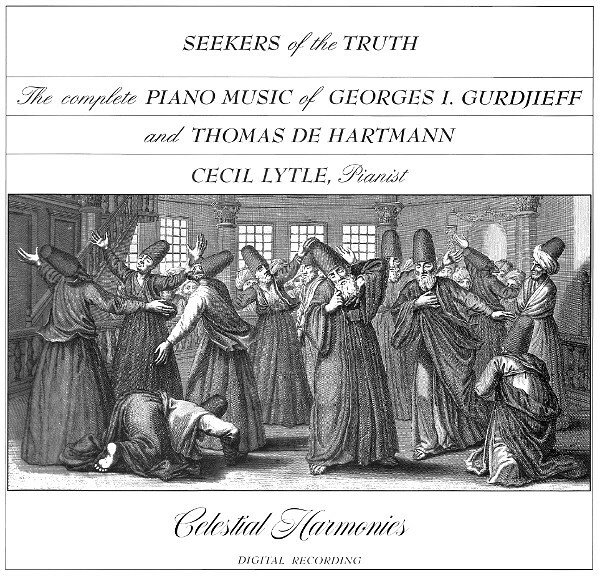 So those wanting to take the completist route are referred to African American pianist Cecil Lytle's six CD traverse for Celestial Harmonies of the complete piano works of Gurdjieff/de Hartmann. Celestial Harmonies is often quite wrongly dismissed as a New Age label. However, I am a big fan of theirs. Not just because in addition to the Gurdjieff/de Hartmann blockbuster they released the invaluable 17 CD Music of Islam anthology. But also because the Celestial Harmonies' website carries this quote from Massimo Vignelli: "Believe, express and defend your responsibility towards society of not producing cultural trash". With thanks to pianist and teacher Frances Wilson for the email which sparked this post. New Overgrown Path posts are available via RSS/email by entering your email address in the right-hand sidebar. Any copyrighted material is included for critical analysis, and will be removed at the request of copyright owner(s). I meant to mention that when I offered up Messiaen's "Nine Meditations For Organ" on your "Meditation music has gone mainstream" post a few weeks ago, I wasn't listening to those pieces for meditative purposes, but rather just as music ... though it may have had benefits beyond only my musical enjoyment.